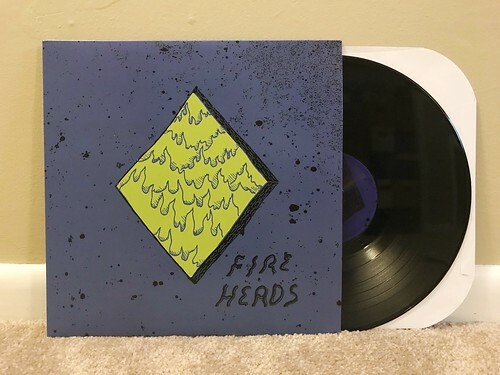 This Fire Heads LP is my first exposure to this band, despite the fact that they've been going since 2012 under various other incarnations and even another name. That said, I am slightly more familiar with one of their guitar players, Bobby Hussy and his work in The Hussy. So I thought I had something of a frame of reference for this album. One thing I can say is that this is a pretty dynamic record, blasting you in the face with noisy chaos like "Dirty Body" and "Next To Nothing" one minute only to drastically shift to bouncier poppy songs like "Dad's Theory" or "Park Walker" the next. For me, I favor the poppier songs and while I'm certainly one that likes their recordings a little loose and fuzzy, I think that the songs where Fire Heads shine the most are the ones that have a little more polish to them. I don't love this record, but it's got a few pretty good songs on it that I think are probably worth checking out. Though, if you like scuzzier garage rock a bit more than power pop leaning bands, this LP may be more suited to your needs.